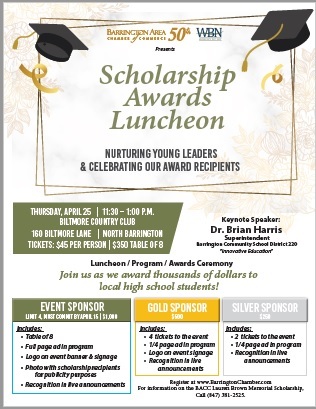 Join BACC for our Scholarship Awards Luncheon. The event includes a delicious lunch, featured guest speaker, and presentation of our Lauren Brown Memorial Scholarship Awards. High school seniors attending Barrington High School as well as any senior student of a BACC member are eligible to apply for the Lauren Brown Memorial Scholarship. Awards range from $500 to $1,500 and will be given for students attending a university, community college, or trade or vocational school. Applications are available on the BACC website.